Held by TÜYAP (Tüm Fuarcılık Yapım Inc.) in cooperation with the Turkish Publishers Association, the 36th International Istanbul Book Fair will open its doors on Nov. 4. The details of the fair, which will be organized under the theme: "Glad to have you, literature," were announced at a press conference that was held in Istanbul. TÜYAP Cultural Fairs General Director Deniz Kavukçuoğlu said they want to contribute to the fair and diversify its beauty every year. Explaining that they aim to increase the number of participant publishing houses and visitors, Kavukçuoğlu said they have made comparisons through visiting book fairs in the world, and added: "Various book fairs have started to produce reader-oriented works, namely for the end consumer. It was actually our aim that we planned 36 years ago. We aimed to bring readers, writers and publishing houses together. I think we have managed it. We carried Istanbul Book Fair onto the international platform eight years ago." Kavukçuoğlu reported that the number of visitors in recent years is above 500,000. South Korea will be the guest of honor at the fair, he said, adding: "There are sincere and friendly bonds between Turkey and South Korea. We are two brother countries. Many of our soldiers have died in the lands of South Korea so that they can reach the situation that they have today. Therefore, I am proud to announce they will be the guest of honor." Kavukçuoğlu also announced that there will be panels, open sessions and interviews in which Ayla Kutlu, the writer of honor of this year, will participate. Many international publishers and writers will be guests at the fair, as well. Turkish Publishers Association President Kenan Kocatürk reported that the International Istanbul Book Fair has turned into a literature and culture festival. Explaining that they will observe the developing publishing trends in the world, Kocatürk said: "We will observe how educational publishing in the world improves and look how education will be shaped according to these results and evaluations. Speakers from Singapore, Finland and Estonia will come. One of the reasons why publishing in Europe has developed is the law of fixed price. This is a system that both regulates the market and protects small publishers against big publishers. It is also one of the factors that sustains the publishing industry. A speaker from the German Publishers Association will tell how this system is applied in Germany." Kocatürk said that South Korea has a dynamic publishing sector - the sixth-largest in 2013 - and that there will be an exchange of information and publishing collaborations at the fair. 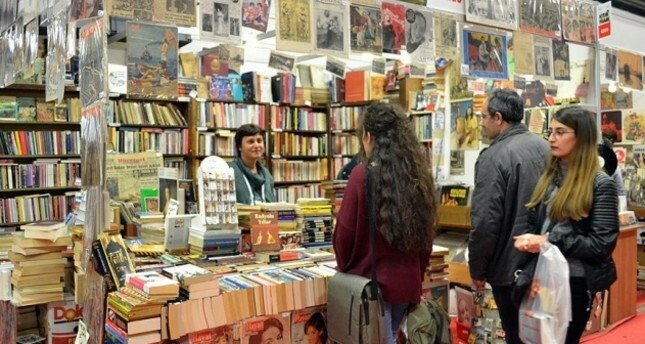 Culture and Tourism Ministry Department of Publications President Sedat Akçaoyunluoğlu said an average of 600 million books have been produced in recent years in Turkey. Akçaoyunluoğlu said: "This situation brings a responsibility to transfer and introduce books to readers. Fairs take big responsibilities in this transfer and introduction. Book fairs are held in many cities. There is a book fair culture in our country, and it isn't less than other countries. In these aspects, Turkey actually goes beyond the ordinary. is line. We have supported the translation of 2,500 works to this day. 1,817 of them have been published in 67 countries and in 60 languages. We will make meetings with international publishers through this fair," Akçakoyunluoğlu said, explaining that the International Istanbul Book Fair is an important event for Turkish publishing. The Republic of Korea to consul-general Istanbul, Cha Young-chul, asserted that Turks and Koreans lived together for a millennium 2,500 years ago. Citing the migration of Turkic people to Anatolia, Cha said: "Koreans follow you to meet again now. We are really similar, as are our cultures. Our languages come from the same linguistic family and we have also common words such as tea, water and mantı. Actually, this is evidence that we lived together for a millennium. This is why Turkey sent 15,000 soldiers to the Korean War. I hope you will know Korean culture and meet Korean authors at the fair." It is expected that nearly 850 publishing houses from home and abroad and nongovernmental organizations will participate in the fair, which will be held at TÜYAP Fair and Congress Center in Büyükçekmece. Prominent authors of South Korea will take place in the fair, where 300 events comprising of panels, interviews, poem performances and children workshops will be held. South Korea will introduce its publishing and culture with a 252-meter stand through references to the relations between the two countries, the 60th anniversary of which is celebrated with the theme: "Two Ends of the Silk Road: Turkey and Korea," this year. While the logo prepared by South Korea is a book with Korea's traditional five colors, special exhibitions introducing the publishing sector and culture of the country will also be held at the national booth of South Korea. After the opening ceremony of the fair, the opening of the national Korean booth will start with traditional Korean dance performances and will continue with other events. While the Istanbul Book Fair is hosting 18 international authors and guests from abroad this year, it will welcome Theodoros Terzopoulos, who a legend concerning ancient Greek tragedies, on a panel and an autograph session on invitation from the Istanbul Theater Festival. Participating in the fair for the first time this year, Colombia will take a place at the International Hall, which will be open from Nov. 4 to Nov. 7. "Gabo, The Magic of Reality" (Gabo, La creacion de Gabriel Garcia Marquez), a film telling the life story and literature of Gabriel Garcia Marquez, one of the most prominent figures in Colombian literature, will be shown as well. The International Hall, which open for professional collaborations and meetings in the publishing sector in 2010, can be visited at the first lobby of the fair between Nov. 4 and Nov. 7. Germany, China, Romania, Colombia, Qatar, India, Azerbaijan, Macedonia, Iran, Bosnia-Herzegovina, Georgia, Bulgaria, Kazakstan, Lebanon, Hungary and Serbia are among the countries attending the fair this year. The fair will be held simultaneously with the ARTIST 2017/ 27th Istanbul Art Fair with the theme of "utopia." It will close on Nov. 12.